Craig achieved international fame when chosen as the sixth actor to play the role of Ian Fleming's British secret agent character James Bond in the film series, taking over from Pierce Brosnan in 2005. His debut film as Bond, Casino Royale, was released internationally in November 2006 and was highly acclaimed, earning him a BAFTA award nomination. Casino Royale became the highest-grossing in the series at the time. Quantum of Solace followed two years later. Craig's third Bond film, Skyfall, premiered in 2012 and is currently the highest-grossing film in the series and the 22nd-highest-grossing film of all time; it was also the highest-grossing film in the United Kingdom until 2015. 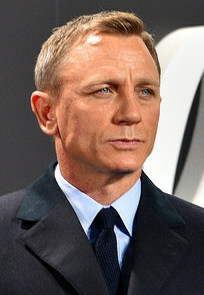 Craig's fourth Bond film, Spectre, premiered in 2015. He also made a guest appearance as Bond in the opening ceremony of the London 2012 Olympic Games, alongside Queen Elizabeth II. His fifth Bond film, tentatively titled Bond 25, is scheduled for release on St. Valentines Day, 14 February 2020. Craig was born in Chester, Cheshire. His mother, Carol Olivia (née Williams), was an art teacher, and his father, Timothy John Wroughton Craig, was the landlord of two pubs, the Ring o' Bells in Frodsham, Cheshire, and the Boot Inn in Tarporley, Cheshire, having served as a midshipman in the Merchant Navy. Aside from English, Craig has Welsh and distant French Huguenot ancestry. Huguenot minister Daniel Chamier is among his ancestors, as is Sir William Burnaby, 1st Baronet. Craig's middle name, Wroughton, comes from his great-great-grandmother, Grace Matilda Wroughton. 1 2 "Daniel Craig Biography: Film Actor, Theater Actor (1968–)". Biography.com (FYI / A&E Networks. Archived from the original on 6 September 2015. Retrieved 8 October 2015. ↑ "Monitor". Entertainment Weekly (1249). 8 March 2013. p. 20. ↑ Hoyle, Ben (15 November 2006). "'Best Bond ever' vanquishes his greatest foe – the critics". The Times. UK. Retrieved 15 November 2006. ↑ Gant, Charles (5 December 2012). "Skyfall windfall is UK box office's biggest ever". The Guardian. London. Archived from the original on 31 January 2013. Retrieved 2 October 2015. ↑ "Bond 25 Announcement". 20 September 2018. 1 2 "Daniel Craig – Biography of the James Bond Star". Chester Chronicle. 23 September 2010. Archived from the original on 5 August 2012. Retrieved 13 July 2013. ↑ Holmes, David. "Chester secures advance screening of new Bond film Quantum of Solace". Chester Chronicle. Retrieved 12 September 2010. ↑ "People Profile, Daniel Craig". Cigar Aficionado. 30 March 2009. Archived from the original on 8 October 2009. Retrieved 12 September 2010. ↑ "Je m'appelle Bond... James Bond". Genealogy Reviews. Retrieved 1 May 2015. ↑ Marshall, Sarah (2008). Daniel Craig: The Biography. John Blake Publishing Ltd. ISBN 978-1-84454-604-6. ↑ "Hoylake Holy Trinity – Homepage". Hoylakeholytrinity.wirral.sch.uk. Retrieved 13 July 2013. ↑ "Biography". Chester Chronicle. 25 January 2011. Archived from the original on 5 August 2012. Retrieved 25 January 2011. ↑ "Daniel Craig – Biography". talktalk.co.uk. 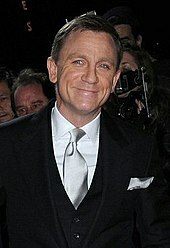 ↑ "Royal seal of approval for Daniel Craig's 007 Skyfall premiere". Wirralglobe.co.uk. Retrieved 13 July 2013. ↑ Slater, Matt (17 July 2006). "A-Hoylake!". BBC News. Retrieved 29 December 2007. ↑ "Colin McCormack". The Stage. 19 July 2004. ↑ Eames, Tom (5 March 2016). "15 big-name stars you forgot appeared in The Young Indiana Jones Chronicles: Daniel Craig, Elizabeth Hurley and more". Digital Spy. Retrieved 16 February 2018. ↑ "Bond star in Heartbeat". Whitby Gazette. 15 August 2007. Retrieved 3 August 2012. ↑ "Daniel Craig: career in pictures". The Daily Telegraph. 13 March 2015. Retrieved 16 February 2018. ↑ Nashawaty, Chris (2 December 2011). "24 Stars' Worst Movies". Entertainment Weekly. Retrieved 16 February 2018. ↑ Raphael, Amy (18 September 2010). "Our Friends In The North made a star of Daniel Craig but almost wasn't made". The Guardian. Retrieved 16 February 2018. 1 2 "Daniel Craig: Our Friend in MI6". BBC News. 14 October 2005. Retrieved 27 December 2007. ↑ Seddon, Gem (29 October 2015). "Here's a 'Tales from the Crypt' That Stars Daniel Craig". Inverse. Retrieved 16 February 2018. ↑ "Saint-Ex (1996)". British Film Institute. Retrieved 16 February 2018. ↑ Lazos, Tracey (10 March 2009). "Obsession". The National. Retrieved 16 February 2018. ↑ Cockrell, Eddie (4 October 1999). "Love & Rage". Variety. Retrieved 16 February 2018. ↑ Robey, Tim (21 October 2015). "Beyond Bond: Daniel Craig's best roles". The Daily Telegraph. Retrieved 16 February 2018. ↑ Rooney, David (25 May 1998). "Love Is the Devil — Study for a Portrait of Francis Bacon". Variety. Retrieved 16 February 2018. ↑ Holden, Stephen (22 November 2000). "Idealism Is a Casualty In War Zone". The New York Times. Retrieved 16 February 2018. ↑ Bradshaw, Peter (25 August 2000). "Some Voices". The Guardian. Retrieved 16 February 2018. ↑ Thomson, Michael (19 September 2000). "Hotel Splendide (2000)". BBC. Retrieved 16 February 2018. ↑ Beresford, Jack (5 January 2018). "16 Things Fans Never Knew About Angelina Jolie's Disastrous Tomb Raider Movies". Screen Rant. Retrieved 16 February 2018. ↑ Morris, Mark (2 January 2001). "Declaration of Waugh". The Guardian. Retrieved 16 February 2018. ↑ "Ten Minutes Older: The Cello". The Times. 11 December 2003. Retrieved 16 February 2018. ↑ Ebert, Roger (12 July 2002). "Road to Perdition". Chicago Sun-Times. Retrieved 16 February 2018. ↑ Vallely, Paul (14 October 2005). "Daniel Craig: Rough cut". The Independent. Retrieved 16 February 2018. ↑ Gardner, Lyn (27 September 2002). "A Number". The Guardian. Retrieved 22 February 2018. ↑ "Evening Standard Theatre Awards 2002 shortlist". London Evening Standard. 13 November 2002. Retrieved 22 February 2018. ↑ Scott, A.O. (17 October 2003). "A Poet's Death, A Death's Poetry". The New York Times. Retrieved 16 February 2018. ↑ Bradshaw, Peter (14 November 2003). "Film of the week: The Mother". The Guardian. Retrieved 16 February 2018. ↑ Crust, Kevin (13 May 2005). "Cast, writing keep 'Layer Cake' fresh". Los Angeles Times. Retrieved 16 February 2018. ↑ Ebert, Roger (19 May 2005). "Layer Cake". Chicago Sun-Times. Retrieved 16 February 2018. ↑ Bradshaw, Peter (26 November 2004). "Enduring Love". The Guardian. Retrieved 16 February 2018. ↑ Schager, Nick (3 March 2005). "The Jacket". Slant Magazine. Retrieved 16 February 2018. ↑ Bradshaw, Peter (5 May 2006). "Fateless". The Guardian. Retrieved 16 February 2018. ↑ Ascherson, Neal (15 January 2006). "A master and the myths of Munich". The Guardian. Retrieved 16 February 2018. ↑ Falk, Quentin (18 March 2005). "The don who came in from the cold". The Daily Telegraph. Retrieved 22 February 2018. ↑ "Anti-Bond protests". Moono. Archived from the original on 19 March 2007. Retrieved 3 April 2007. ↑ La Monica, Paul R. (6 November 2006). "Blond, James Blond". CNN. Retrieved 2 April 2007. ↑ Medley, Mark (14 September 2006). "Pierce Brosnan answers". The Globe and Mail. Toronto. Retrieved 18 September 2017. ↑ "The George Lazenby of 007s: A Conversation with George Lazenby". popcultureaddict.com. Archived from the original on 13 October 2012. Retrieved 3 August 2012. ↑ "Owen backs 'proper actor' as Bond". BBC News. 19 September 2006. Retrieved 19 September 2006. ↑ "Casino Royale box office results". Box Office Mojo. Retrieved 4 January 2008. ↑ Lyall, Sarah (17 November 2006). "New Bond". The New York Times. Retrieved 25 January 2011. ↑ "New Bond film title is confirmed". BBC News. 24 January 2008. Retrieved 24 January 2008. ↑ "Campbell and Broccoli explain the shift from Brosnan to Craig, hints for Bond 22 plotlines". MI6-HQ.com. 18 November 2006. ↑ Bond, Paul (26 October 2007). "Sloan sees hope in talks". The Hollywood Reporter. Archived from the original on 28 October 2007. Retrieved 3 November 2007. ↑ Saltzman, Marc (13 November 2010). "New generation of gamers play Bond in 'Goldeneye'". USA Today. Retrieved 20 August 2011. ↑ Gritten, David (5 January 2007). "You wait years for a good Capote film, then two come along at once". The Daily Telegraph. Retrieved 16 February 2018. ↑ Holden, Stephen (22 September 2006). "Even in a Place Like Paris, It's Not Good to Live Forever". The New York Times. Retrieved 16 February 2018. ↑ "Academy Invites 115 to Become Members" (Press release). Academy of Motion Picture Arts and Sciences. 18 June 2007. Archived from the original on 24 December 2007. ↑ Ebert, Roger (16 August 2007). "The Invasion". Chicago Sun-Times. Retrieved 16 February 2018. ↑ "Craig lands role in Pullman film". BBC News. 18 August 2006. Retrieved 19 August 2006. ↑ "Michael to be in Tate sketch show". BBC News. 17 July 2007. Retrieved 9 September 2007. ↑ Lyng, Eoghan (2016). "The Ten Best Daniel Craig Movie Performances". Retrieved 12 January 2018. ↑ "Voices on Antisemtisim interview with Daneil Craig". United States Holocaust Memorial Museum. 12 March 2009. Archived from the original on 5 May 2012. ↑ Brantley, Ben (29 September 2009). "Daniel Craig and Hugh Jackman on a Sentimental Journey". The New York Times. ISSN 0362-4331. Retrieved 13 November 2015. ↑ Fleming, Mike (26 July 2010). "Daniel Craig Closes Deal For 'The Girl with the Dragon Tattoo'". Deadline Hollywood. New York. Retrieved 26 November 2006. ↑ "Rachel Weisz, Daniel Craig And Naomi Watts To Star In 'Dream House'". FilmoFilia. Retrieved 11 February 2010. ↑ Ehrenreich, Ben (11 November 2007). "PHENOMENON; Comic Genius?". The New York Times. Retrieved 13 July 2013. ↑ "It Books and Platinum Studios Announce "Cowboys & Aliens" Graphic Novel Paperback Edition on Stands 28 June 2011". Marketwire.com. 1 June 2011. Retrieved 13 July 2013. ↑ Reynolds, Simon (17 October 2011). "'Adventures of Tintin': 10 teasers for Steven Spielberg's blockbuster". Digital Spy. Retrieved 20 February 2018. ↑ Taylor, Sophie (20 April 2010). "Daniel Craig's Bond film put on hold indefinitely". The First Post. Retrieved 12 September 2010. ↑ "Daniel Craig signs up for two more Bond movies". New York Post. 8 September 2012. Retrieved 13 July 2013. 1 2 "Daniel Craig to play James Bond in at least two more films". The Guardian. Manchester. 30 June 2015. ↑ "Daniel Craig hosts 'Saturday Night Live,' spoofs 'Bond'". ontheredcarpet.com. 7 October 2012. Retrieved 8 October 2012. ↑ "Daniel Craig Heads Back To Broadway With 'Betrayal'". All Things Considered. 18 September 2013. Retrieved 26 September 2013. ↑ Cox, Gordon (5 April 2013). "Daniel Craig, Rachel Weisz to Star in Broadway 'Betrayal'". Variety. Retrieved 26 September 2013. ↑ "Daniel Craig and Rachel Weisz claim huge success with Betrayal on Broadway". The Guardian. 7 January 2014. Retrieved 16 January 2014. ↑ Barnes, Brooks (20 April 2017). "Five Studios' Mission: Winning the Distribution Rights to James Bond". The New York Times. Retrieved 21 April 2017. ↑ "Daniel Craig, Tom Hardy & Will.i.am recite 'Invictus' to support the Invictus Games". YouTube. 29 May 2014. Retrieved 9 May 2016. ↑ "When are Prince Harry's Invictus Games and what are they?". The Daily Telegraph. 8 May 2016. Retrieved 9 May 2016. 1 2 Lee, Chris (17 December 2015). "Daniel Craig's Star Wars: The Force Awakens cameo revealed". Entertainment Weekly. Retrieved 17 December 2015. 1 2 Snyder, Diane (13 December 2016). "Othello, New York Theatre Workshop, review: 'Daniel Craig chills the blood, David Oyelowo arouses the passions'". The Daily Telegraph. Retrieved 1 March 2018. ↑ Busch, Anita (26 May 2016). "Daniel Craig And Katherine Heigl Finalizing Deals To Join Steven Soderbergh's 'Logan Lucky' As James Bond News Surfaces". Deadline Hollywood. Retrieved 8 January 2017. ↑ Bradshaw, Peter (14 September 2017). "Kings review – Halle Berry and Daniel Craig fail to ignite baffling LA riots drama". The Guardian. Retrieved 20 February 2018. ↑ Couch, Aaron (21 August 2018). "Danny Boyle Exits Next James Bond Film as Director". The Hollywood Reporter. Retrieved 26 August 2018. ↑ Sessums, Kevin (26 October 2008). "The Man Who Loves Being Bad". Parade. Retrieved 27 October 2008. ↑ "Daniel Craig". Monsters and Critics. 25 January 2011. Archived from the original on 11 April 2011. ↑ "In One Quote, Daniel Craig Just Slammed Hollywood's Sexist Aging Double Standard". Mic. Retrieved 13 November 2015. ↑ "Daniel Craig". People. 22 October 2012. Archived from the original on 31 January 2009. Retrieved 22 October 2012. ↑ "Nicole Kidman & Daniel Craig". W. Archived from the original on 14 May 2014. Retrieved 19 May 2014. ↑ "Daniel Craig and Rachel Weisz get married". The Guardian. London. 26 June 2011. Retrieved 13 October 2012. ↑ "Daniel Craig and Rachel Weisz say 'I Do' in a secret wedding!". BeautyMania.biz. Retrieved 25 June 2011. ↑ "Daniel Craig and Rachel Weisz welcome first child together". The Independent. 1 September 2018. ↑ Leach, Ben (12 October 2008). "James Bond actor Daniel Craig buys £4 million home in area fit for a spy". The Daily Telegraph. UK. Retrieved 25 October 2008. ↑ "James Bond star Daniel Craig enjoys Liverpool FC victory over Newcastle". Liverpool Echo. 4 May 2009. Retrieved 7 November 2012. ↑ Fulton, Rick (28 November 2007). "Daniel Craig: My New Movie Is Not Anti-Religion". Daily Record. Glasgow. Retrieved 18 September 2017. ↑ "Broadway Cares". Broadway Cares. 9 February 2010. Retrieved 6 September 2010. ↑ "Clearing the road for Daniel Craig". SafeKenya.org. 9 May 2016. ↑ "The Opportunity Network's 2016 Night of Opportunity Gala". Retrieved 12 April 2016. ↑ Addley, Esther (7 March 2011). "James Bond video for international women's day shows 007's feminine side". The Guardian. ↑ "Stars Write To Broadcasters For Diversity". Look to the Stars. 21 August 2014. 1 2 "Bond actor Daniel Craig's new 'licence to save' role" (14 April 2015). BBC News. 16 April 2015. ↑ Richardson, Bradford (10 September 2015). "Bond actor donates $47,000 to Sanders PAC". The Hill. ↑ Hidalgo, Pablo (3 July 2016). "Yeah, same with Infinity". @pablohidalgo. Retrieved 7 July 2017. ↑ "China's Bliss Media, Maven Pictures to Finance Halle Berry's L.A. Riots Movie". Variety. 16 December 2016. Retrieved 3 January 2017. ↑ "Imdb page for 'Comrade Detective'". 29 July 2017. ↑ "OMEGA Watches: Orbis". www.omegawatches.com. Retrieved 6 June 2017.